Did you know that Marie Kondo once worked as a Shinto shrine maiden, or miko, for five years? If so, it will come as no surprise that the KonMari folding method for clothing is more akin to a gentle meditation or origami session than a tedious chore. Find out how the KonMari method of folding clothes can solve your storage woes — and maybe even bring a little joy to laundry time! Why Use the KonMari Folding Method? According to tidying expert Marie Kondo, clothing takes up much less space when folded vertically rather than horizontally or even by hanging it on hangers. Although it dependes somewhat on the thickness of the clothes in question, you can fit from twenty to forty peices of folded clothing in the same amount of space required to hang ten. If you think about it, it absolutely makes sense to fold clothes so that they can be stored vertically. When clothing is stacked in your drawer you can only see the item that is on the very top of the pile, which means you will need to dig down and search for other items that may be underneath. However, with a vertical storage system, you can open your drawer and see every item of clothing at a glance! She also believes that while taking your clothing in your hands and folding them neatly you are transmitting energy, which in turn has a positive effect on clothing. Pulling the clothing taut, smoothing out the wrinkles as you go, folding them neatly, all of these actions are an expression of love an appreciation, which is natural if you declutter correctly using the KonMari method and surround yourself with only those items that spark joy! * You will see mention of “leave a gap” when folding clothing. The small gap allows space for the clothing being folded to move and settle into place and get the perfect fold. When folding skirts with the KonMari method you need to consider the length of the skirt. The folding method below works well for A-Line and pencil skirts, but if you have a maxi skirt you might choose to instead fold it like a dress as described further down. Here is a visual layout of all the steps. The front of the shirt should be on the outside, especially if has a logo, so that you can identify the shirt at a glance. Therefore it should be laid front down. Also, when folded properly no part of the collar or neckline should be visible when the shirts are stored vertically. Sweaters and hoodies can be folded the same way as shirts, except the front of the hoodie faces up for the hoodie if it has a zipper. The long arms will be folded back just like the shirt sleeves, and the hoodie is laid down on top of the sleeves once they are folded. Here is an image of all the KonMari sock folding steps. This folding technique is good for all underwear types, including thongs, bikini bottoms, and boyshort-style underwear. 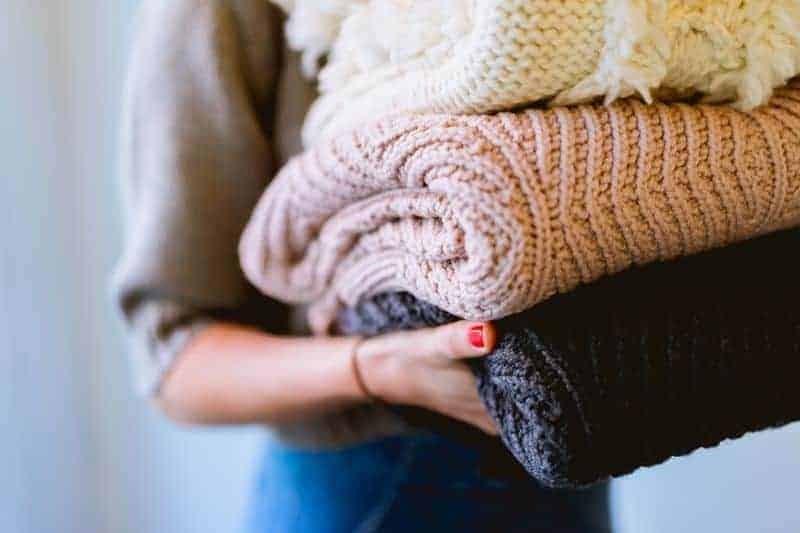 Because scarves are very soft and loose and can be quite large, Marie Kondo actually recommends rolling them rather than folding them. Depending on the size of your scarf, you may fold the scarf in thirds or in halves. Again, this depends on the size of your scarves and the size of the container you want to store them in. 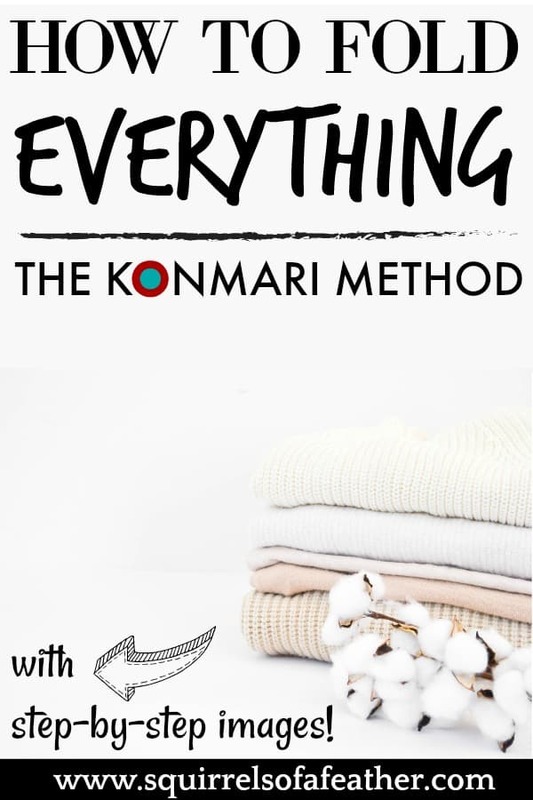 Now you know how to fold clothing the KonMari way! I hope you enjoyed this visual guide to using the KonMari method. Remember, the key is to fold in halves and thirds until you get a small rectangle which can be stored vertically. If you keep these two rules in mind, you can fold literally anything with the KonMari method! If you have any remaining questions about how Marie Kondo folds clothing then you might like to check out her book, Spark Joy, An Illustrated Master Class on the Art of Organizing and Tidying Up, which includes lovely illustrations and descriptions on how to fold all types of clothing, in her own words! Psst! 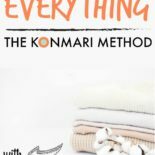 Don’t forget to sign up to get your FREE 5-page KonMari checklist! « This Simple Slow Cooker Oxtail Soup is Hearty and Tender! Great post Marissa. I did this a few weeks ago and cannot believe I lived the other way all my life. Now reading the book and getting ready to tackle the rest of the house. Her method is truly a game changer. I have been folding and storing most of my clothes this way for years. I don’t know where she got the idea, but a friend put me onto it for my T-shirts about 9 years ago and I was amazed how much neater it made my dresser drawers. This works so well, I just might have to get KonMari’s book. I do my towels a little differently, though, because I like them to be folded lengthwise first – the way they would hang on the towel rack. Thanks for the tips. I have to start storing my folded clothes vertically – I need more space! My teen daughter just reorganized her t-shirt drawer with everything stored vertically, and it looks fantastic!! Let me know how it goes with your drawer — sounds like your daughter is on top of her game!